Apply stain when the air and wood surface temperatures are between 50°—90°F. Avoid applying in direct sunlight. In this edition of “Just Ask Bruce” from Minwax®, Dave has an old nightstand that needs refinishing and some basic repairs. Instead of buying a new one, he wants to recycle this old piece of furniture to save money and fix it up to last a lifetime. – Start by sanding the wood with 120-grit, then moving to a 220-grit sandpaper. – Use a pre-stain wood conditioner to ensure the stain applies and dries evenly, without blotches. – Apply a wood stain in your favorite shade with a natural bristle brush, along the direction of the grain. – Add a coat of clear protective finish for that extra bit of shine and long-lasting protection. 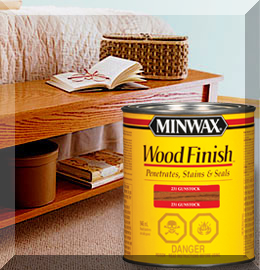 Used in this video: Minwax® Pre-Stain Wood Conditioner, Minwax® Wood Finish™ in English Chestnut, and Minwax® Fast-Drying Polyurethane. Visit https://www.minwax.com for more how-to tips and project ideas.